It's the cries that dragged her harshly from her slumber. Desert sands and gray skies were replaced with frozen darkness and sobs of sorrow that poured from her lungs every time she tried to breathe and rise to the surface. The dream explodes around her as the cries pour into the window like snow-- heavy, wet and hungry. So Isra shakes free from her blankets and runs from the castle as quickly as she can. The stones are slick under her hooves but she's heedless of the danger, oblivious to anything other than those screams and the way her bones tremble with heart-breaking sound. On and on she runs, following only the song of suffering and ignoring all those that call out to her that the night isn't safe (that no where is safe anymore). When the buildings become both further apart and fewer in number the screams are louder. Here she's the only one among the ghosts of fortunes and families and dreams. She's another shadow, another speck of darkness that seems black enough to swallow up any trace of light and make it dark. Here are the ghosts of the tidal wave and when Isra turns her head she sobs when it's only a bone glinting in the moonlight that caught her eye. Some part of her screams to turn back, to flee back to her silken, cob-web bed and forget how the night wails and wails and wails. But ahead she can see the moon rays lingering over a pile of wooden planks and thatch and when she draws closer the wails seem younger and weaker as if whatever is trapped has already devoured all the energy left in the world. 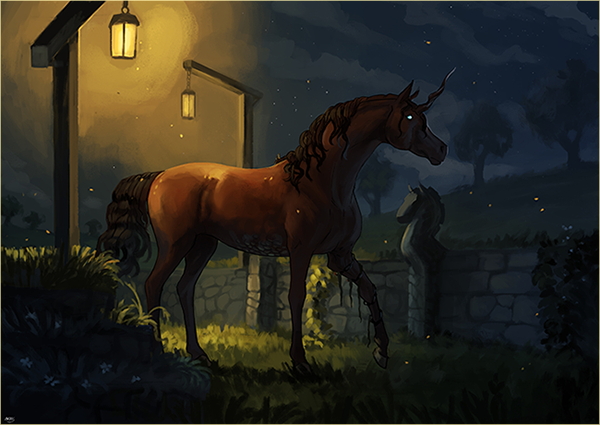 Isra moves closer, cautious and light on her unicorn hooves, and touches her horn to the wood like a knock. Help me. The thing beneath the rubble says and Isra sobs wildly as she puts the name of 'horse' to the trapped creature. Her knees tremble as she pushes out whatever weak magic lives in her towards the pile of wood. “Just a little longer,” She pleads as she prays to her goddess, to any gods, to anything beyond space and time that might hear her. The horn upon her head feels weak as she pries at the wood with it, trying to pick apart any loose pieces of this death trap. And when she hears the sound of hooves at her back on the end of another prayer, another plea, she turns with wild, wet eyes and begs (more than she has ever begged in her life) “Help me.” For the wailing night is almost silent enough to be a grave when all the cries turn to the bleating gasps of the dying. Whoever is trapped beneath the rubble doesn't have very long and Isra can feel only urgency and panic in her heart. "But the silence was unbroken, and the stillness gave no token,"
It is so dark and quiet and still in the midnight that Marisol feels almost (almost) peaceful. She stands in Denocte and tilts her head to the sky, watching the stars blink in and out of darkness, and for the first time in weeks her wings drop at her sides and her heartbeat slows and she is not filled with the rushing kind of fear that has followed her since the very first drop of rain fell in Terrastella. She smells the wet cobblestone, the grass fresh and green. Lanterns wobble against their sconces. For all her stubbornness, there is a kind of magic about the Night Court that even Marisol cannot deny - they way it is somehow most lit up in darkness, or how the citadel is made of moonshine, not stone. She tries not to think about it too much. Thankfully (or not) her thoughts are turned away in the next moment, when a scream erupts from the citadel, wailing, shrieking, sobbing. She drops to her knees and shoves a shoulder under one of the rotten planks, lifting until it breaks against the cords of muscle; in the damp darkness she hears the sound of tears and heavy breathing and grits her teeth, so not to answer it. "a burnt child loves a fire." Her heart sings a frantic song, rattling against her bones as if they are harp strings. It rips through her veins as if it is but hair and the tunnels of her body nothing more than the insides of some strange and massive flute. Isra wonders if this wild song will be the end of her, bits of her bursting out from her bones when her heart decides this fear and sorrow no longer suit it. 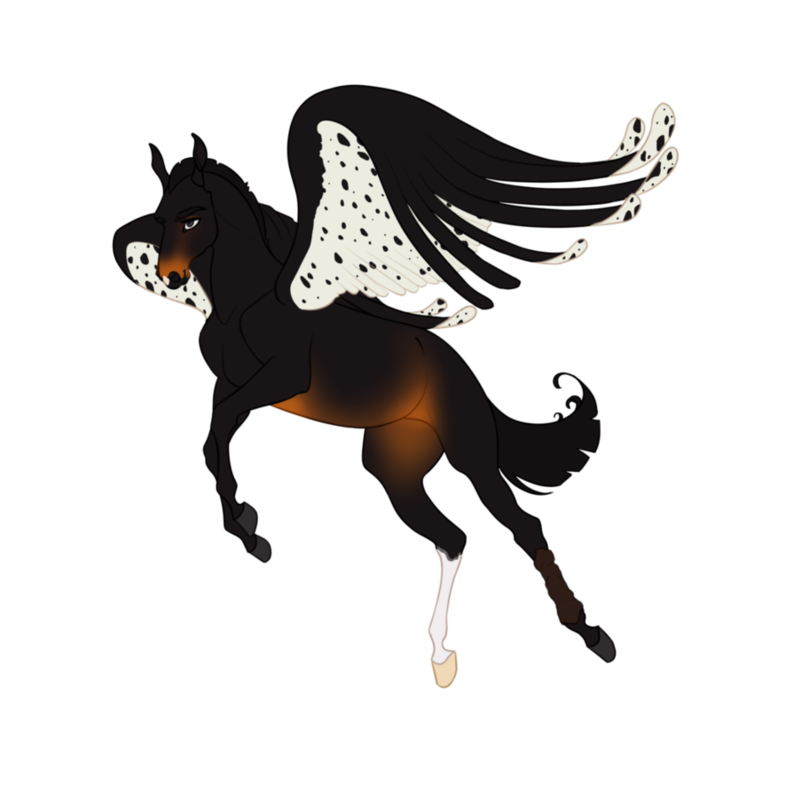 But when the pegasus comes her wing feels like a blanket, a sea of feathers that Isra could float away one. The queen inhales and drinks of the darkness between those feathers and the song of her heart is snuffed out, suffocated by down and kindness and empathy. She wants to press her lips to those feathers and kiss that darkness between the white. Isra's digging turns wild with a new fervor now that she's not alone with the cries and the bleating sound of a creeping death. All she can smell is rot and feather, sea and churned up dirt and all she can think of is death and speed and fear and wings. For the first time her horn is a weapon and she shreds rotten wood like a different sort of unicorn might shred flesh. Sweat covers her and drips down into her eyes and it mixes with her tears. All she can taste is salt on her lips (salt and wood). They dig and shred and Isra feels like a violent thing as she uses teeth, horn and hoof to destroy what is left of someone's life. Perhaps, part of her whispers, this is what freedom feels like. Just as she gets a rhythm down-- hoof-horn-teeth, hoof-horn-teeth-- the rest of the rotten wood crumbles down to nothing and maggots and centipedes crawl across the black like bits of bone. And between those petals of wood, insect and torn up cloth is a yearling (whole but from the burn of his lungs). He's golden against all that blackness and at his hooves is a pile of strange treasures washed up from the sea. Isra looks at all those bits of coral and shell both hates and understands the call of such things (strong enough to carry them all from safety over and over again). Still, though she looks at him with a quiet sort of fury built up between the tears and the fear and she feels like she might explode with all of it. She waits for the child to gather his breath, the danger passed now that the rubble is clear and seems for the moment stable enough to allow them all a moment to cool that fury, fear and wildness in their blood. It almost feels like a dream when she turns to the other mare. At first all she can see if those feathers and she remembers to swallow up the urge to press her cheek against them before she speaks. “Thank you.” Isra whispers weakly and it feels like her heart has burst from her chest and grown wings even though the moment of madness as passed. She wishes for a minute that she were something sharper-toothed and more violent, that she had claws and fangs rather than these horribly delicate sable feathers and the ivory of her bones she knows is useless buried this deep underneath her skin. Marisol’s sweat speckles the dark, dark dirt under her knees, and when the moon catches them, it shines a light on two women more desperate than human. Her lungs burn against her chest. She scrapes her rough-edged hooves against the soft, rotten wood and plows through layers of silt, mulch, ants and centipedes and crystals of salt and shells washed up from their too-frantic ocean. Nothing matters, not really, except for the sound of breaths rattling from deep in the ground and the effort she puts into digging farther, farther, farther. And somehow always closer. When the world splinters apart, Mari chokes a sigh of relief at seeing the body underneath unharmed - dirty, sure - bruised, a little - but all his bones the right angles, all his skin unslashed, his blood does not salt the earth, and for that Marisol is eternally grateful. She squeezes her eyes shut. She tips forward to rest her dark forehead against the dirt for a long breath so deep it burns in her chest and then she finds her strength again and reaches forward to pull the boy out. She does not say Commander, or pilot, or Terrastellan. It does not seem to matter anymore. For a moment her eyes snag not on youthful golden flesh or wood broken up with worms and maggots but on skin as dark as her own. Isra feels a kinship there, the darkness of their flesh and the way their lungs flutter and dance and burn out a frantic song beneath their bones. Perhaps that is why she feels bold enough to press her nose to the mare's feathers for not more than a second. Or, she only wanted to feel something soft against all the salt and splinters on the her lips. Isra watches her usher the boy up, watches the way the moonlight catches on the hollow places on the yearling and the mare. There is something there, Isra thinks, some similarity that floats just out of her reach like a firefly in a rainstorm. Maybe it's the way the yearling catches her eye with his own gaze that looks a little like fire, daring his queen to release all that sad fury pooling under the tightness of her spine. Isra cannot help but smile at him and a shadow in her smile suggests that she would have chased the shells and the golden coral into hell too. “Let's get you home.” She swallows down all that rage and fury and it tastes as bitter and salted as brine. Her eyes are eager to return to Marisol, to see the tenseness of her smile and think it strange a smile could ever seem a little like a war. Isra's own lips arc in response, and she closes that distant between her flesh and Marisol's flesh once the child turns and heads back towards the citadel. “Marisol.” She teases the sound of it between her tongue and her teeth. It tastes like rainwater and twilight. Isra sighs for the taste of it and thinks perhaps that stardust might taste a little like-- Marisol. Isra wants to be a story, a legend, a thing worthy of ink and leather.“Will you walk him home--” She pauses, imagining it as an empty space of paper between the start of one paragraph and the next. “with me?” And oh! That part swirls in spirals from her lips like ink blotted on the very first page of some long forgotten religion. She smells the rain in the air and it is both a comfort and a terror. In the near-darkness, interrupted only by little slices of moonlight, the freckle of watching white stars, every one of them could be something else, if they wanted to - disappear easily enough into the almost black that Marisol almost does not feel self-conscious at the brush of Isra’s lips against her feathers. She looks at the Night Queen with huge gray eyes that have gone luminescent in the gloom. Almost she thinks she sees a smile on those dark lips, almost, almost, but even like this, rain-drunk, invisible, Marisol is not quite brave enough to say something, or to smile back; instead she blinks a swath of soft, dark lashes against her cheeks and folds her wing back against her ribs and turns her gaze down, down to the dark ground broken open beneath their feet. Isra speaks and it echoes through Marisol’s whole body and into her bones. She knows the Night Queen’s name and her station - of course she does - but the introduction bypasses strangeness and takes them straight into knowing. Will you walk him home with me? Still with one knee bent into the dirt, Marisol meets her eyes and raises a brow ever so slightly, careful, unsure, wondering. Of course, she murmurs, and clambers to her feet. The heart of Denocte glimmers over the hill, far far away, shining warm light against the night sky, and Marisol brushes a shoulder against Isra’s as she starts to walk. The walk back seems sweeter now without panic running through her veins like acid. Each step Isra takes echoes Marisol's, left to left and right to right. It feels like a sacred thing to her, to be a unicorn and walk to the sound of whispering feathers and steps lighter than her own. Each meter they walk is a song, a soft melody filled with lights and clarion hoof-steps, feathers and scale-glimmer. Ahead the hill gathers, darker than the night sky, and the lights reflect off it like wishes off a sun glare. Isra thinks of dragons, floods and fates as their steps climb up, up, up. It feels like her heart is soaring too and the sadness is nothing more than a passing shower. How can she be sad when the boy laughs and prances before them like a knight? He leads his queen as if he has saved the two mare instead of them him. Isra is happy to let him pretend, happier to watch his sides expand and contract with fresh, spring air. “Denocte owes you a debt, Marisol.” Her voice is as soft as her heart is wild (humming in her chest like a bee). The hill seems a little brighter as they crest it, a little less like a dragon and more like a dream. Their shoulders brush together again (silk and feather, scale and flesh). Isra sighs for the contact softly enough that it might be nothing more than a weary inhale. She wonders if Marisol notices how her heart thrums and sings like a eagle between her chest. Ever, the promise hangs, unspoken in the space between us and it dances in the dark silence. And when her eyes turn and catch on Marisol's there is a plea tangled up with the promise (so tangled it's hard to tell when one begins and another ends). At the bottom of the hill the mother nickers lightly to Isra and with one final, longing look at Marisol (that says, find me, find me again), she takes of down the hill. In the moonlight her hooves look both as joyful and shy as the boy's did. But unlike the boy Isra doesn't look back, no matter how her heart sings and yells and roars at her to. Denocte owes you a debt, Isra says, and Marisol cuts her gray eyes to the Night Queen and almost wants to laugh. She holds it down. Because what debt of Denocte’s could not repaid for the way they have housed and clothed and fed her people since the rains came in and washed their lives away? She smiles a little, a tight-lipped, bare thing, and hopes that Isra sees it for what it is and what it means. When their shoulders brush she shivers, and it could be the touch or it could be the warmth sprouting against the cold around them. Marisol is not much for contact. The casual way Isra hands her a touch, a smile, a compliment - it’s all foreign and intoxicating for someone who is used to hiding her heart like a diamond in coal. The world opens up ahead of them, dark and silver, sparkling under the watchful eye of the strawberry moon overhead. Thank you, the Commander says to Isra’s offer, and when the Night Queen starts to walk away her heart twists in her chest and almost - almost - she wants to ask something. Where are you going? When will I see you again? But already Isra is being swallowed by the darkness, and Marisol is woman enough to hold her tongue and time and time again. She watches the queen and the boy disappear, and then takes off into the sky with a flap of huge wings, soaring into the air above Denocte in a soundless torrent.